Saints: Tuala; K Pisi, G Pisi, Burrell, Elliott; Myler, Dickson; Corbisiero, Hartley (c), Ma’afu; Lawes, Day; Wood, Clark, Manoa. Replacements: Haywood, A Waller, Denman, Dickinson, Fisher, Fotuali’i, Stephenson, Wilson. Saracens: Goode; Wyles, Taylor, Barritt, Strettle; Farrell, Wigglesworth; M Vunipola, George, Du Plessis; Kruis, Hargreaves (c); Itoje, Burger, B Vunipola. Replacements: Brits, Barrington, Figallo, Hamilton, Wray, De Kock, Hodgson, Ashton. Outs: Saints: Ben Foden (knee), George North (concussion). Saracens: Will Fraser (back). Tom’s preview: In the Welford Road press room at the conclusion of last weekend’s game, some national journalists were left with a conundrum. With the Aviva Premiership play-off semi-finals taking place on the same day - this Saturday - they needed to make a choice. Would they head to Franklin’s Gardens to see Saints take on Saracens or would it be the other heavyweight fight, between Bath and Leicester at The Rec. The general consensus was that Bath against Tigers may have more appeal. Not because the teams are stronger, but because the tie was fresh. Rarely do Tigers, who always make the play-offs, meet old foes Bath, an emerging force, at this stage of the season. Whereas the other semi-final was between teams who are all too familiar with clashing in the end-of-season shoot-out. Since they met in a play-off semi-final in 2010 - Saracens won 21-19 at Franklin’s Gardens - these two teams have been on a constant collision course. Games against Sarries have been seminal for Saints, whose most agonising, and energising, moments have come against the Barnet-based team - and Leicester. In the early days of the rivalry spawned by that game in 2010, when Saracens left the away dressing room door open when singing their victory song, the men in black prevailed. They were a team Saints just could not shake off, proving as irksome as a wasp at a picnic. Saracens simply would not be beaten by Jim Mallinder’s men in the big games, believing they would come through in the end. But then, in 2013, the tide finally turned. Saints, powered by the ‘Why not us?’ philosophy after taking criticism to heart in a campaign when they finished fourth, found the strength to slay Saracens at Allianz Park. It was a huge power shift and gave Mallinder’s men, who were to lose in the infamous Twickenham final to Leicester, a real shot in the arm for future meetings. 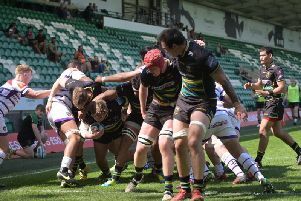 They retained their self-confidence all the way through last season’s final, seeing off Saracens with an Alex Waller try in the dying seconds of extra-time. And this season, they have beaten Mark McCall’s side twice in as many meetings, showing staying power once again to outlast their rivals at stadium:mk last month. This weekend’s meeting will once again ask Saints to show how far they have come. Not just since 2010, but since last season. It was said the champions tag would weight heavy on their shoulders. But instead it has inspired Mallinder’s men, who used the authority gained from their first title to top the regular-season standings this time round. This time, it was Saracens who were sneaking into fourth. But, that, as it did for Saints in 2013, will give them a freedom. A desire to upset the odds. Saints will need to ensure that doesn’t happen. That familiarity continues to breed contempt for Saracens. And if they can do that, a third successive Premiership final would be on the cards.